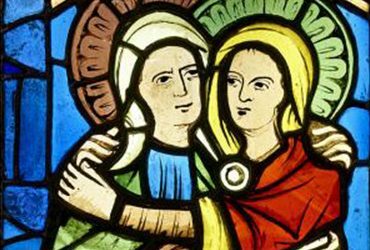 The Visitation (detail), c. 1350. Gift of Mrs. Ella Brummer in memory of her husband, Ernest Brummer. The Medieval European Art Gallery displays important architectural sculpture, devotional objects and stained glass from the Romanesque and Gothic periods. With the purchase of the Brummer Collection of medieval art in 1966, Duke University established its first art museum. This acquisition signaled the university’s recognition of the cultural importance of actual works of art in the education of students. Visitors enjoy the gallery talk about the newly restored stained glass in the Medieval Gallery. The Medieval period, also known as the Middle Ages, is roughly considered to be the millennium spanning the fall of the Roman empire in 476 CE to the Renaissance. Most of the surviving artwork from this period is religious in nature, commissioned by the Catholic Church or donors to facilitate worship and devotion. The majority of the works in this gallery decorated Christian churches in Europe between 1000-1400. Stone architectural sculpture surrounded doorways to greet the faithful with images from the life of Jesus and the final judgment, when he would return to judge all mankind. Stained glass enlivened wall surfaces and created interiors that shimmered with an otherworldly light. Interior sculptures elaborated on the lives of saints and provided exemplars of faith and obedience. With the purchase of the Brummer Collection of medieval art in 1966, Duke University established its first art museum. This acquisition signaled the university’s recognition of the cultural importance of actual works of art in the education of students. Visitors use the digital interactive display to color medieval sculptures depicting four disciples of Christ. 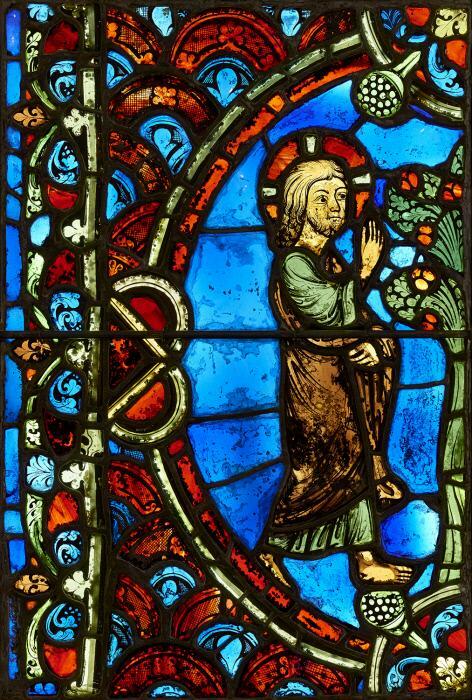 This gallery also contains “Medieval Color Comes to Light,” an interactive light painting application that allows visitors to project vibrant colors onto 800-year-old limestone sculptures depicting four disciples of Christ. 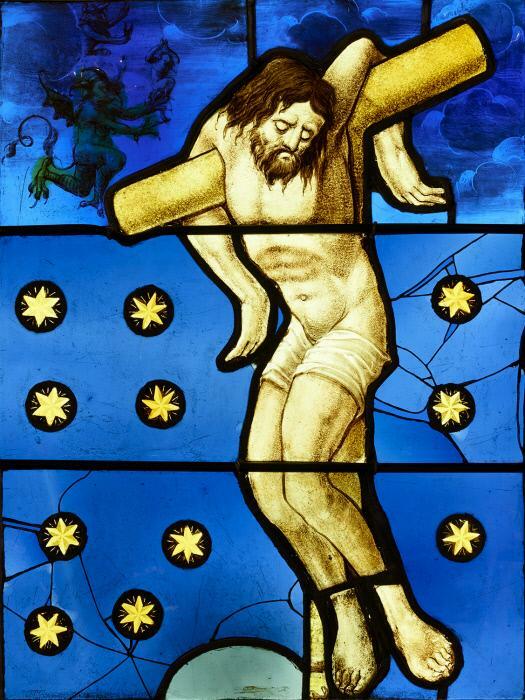 The digital interactive display reveals bright pigments that have been worn away by the centuries. The project team of Duke faculty and students, “Lives of Things,” was led by professor Mark Olson from the Department of Art, Art History & Visual Studies, and post-doctoral researcher Mariano Tepper from Computer and Electrical Engineering, in collaboration with professors Caroline Bruzeluus (AAHVS) and Guillermo Sapiro (CEE). 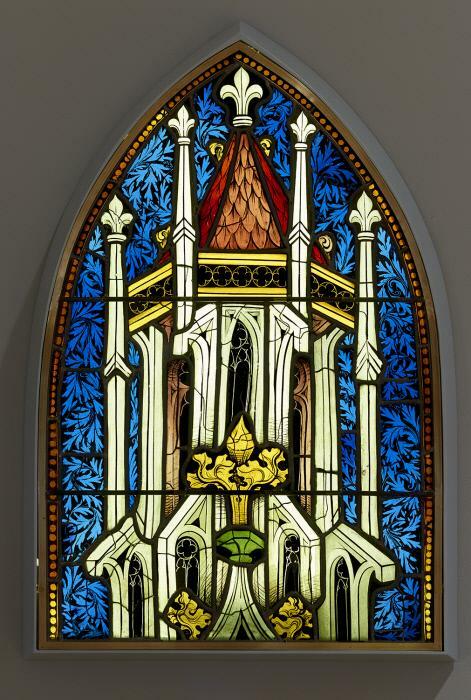 Austrian, Top of lancet window with architectural canopy, 1400-1430. Stained glass and lead, 29 1/2 x 19 1/8 in. (74.9 x 48.6 cm). Gift of Mrs. Ella Brummer in memory of her husband, Ernest Brummer..
French, God and the Tree of Knowledge, c. 1250. Stained glass and lead, 26 x 17 7/8 x 1/4 in. (66 x 45.4 x 0.6 cm). Gift of Mrs. Ella Brummer in memory of her husband, Ernest Brummer. The Visitation, c. 1350. Gift of Mrs. Ella Brummer in memory of her husband, Ernest Brummer. Flemish, or German, The Bad Thief, c. 1525. Stained glass and lead, 22 1/4 x 16 1/2 in. (56.5 x 41.9 cm). Gift of Mrs. Ella Brummer in memory of her husband, Ernest Brummer..
Slideshow of pieces within the Medieval European Art gallery.